LONDON (Reuters) - In a Nordic country used to a high level of state social care, Finns were shocked to hear of care homes leaving elderly patients all night in soaked diapers, a scandal that may play a part in helping the left return to power after 20 years in opposition. With one of the most rapidly aging populations in the world, Finland is on the front line of a problem affecting most Western countries - how society can afford to care for an ever larger population of the elderly and infirm. Finland predicts its social and healthcare costs will jump to 26.5 billion euros per year ($30 billion) in 2035 from 18.7 billion in 2018. That increase would push up such costs as a share of gross domestic product to 9.6 percent in 2035 from 7.9 percent in 2018. Centrist Prime Minister Juha Sipila had hoped to offset the rise by cutting services and stepping up privatization. But the task of reforming the healthcare system proved too great and Sipila's center-right government resigned. Parliamentary elections will be held on April 14. Concerns about social welfare have been a gift for the opposition Social Democrat Party (SDP) that has led polls for almost a year, with 20.1 percent of the vote in the latest one by public broadcaster Yle. The party has promised to raise taxes, set limits for healthcare privatizations, and increase all state pensions of less than 1,400 euros per month by 100 euros. Worries about the future are particularly acute in places like Forssa, a town of 17,000 people in the southwest that depended for over 150 years on its textile industry, which has been in decline since the 1980s and has seen many younger people leave as jobs disappear. "There is no one at home. My husband is dead and my children out in the world," 87-year-old Raili Huhtala said in a public nursing home where she moved to after being partially paralyzed by a stroke a few years ago. Like Huhtala, a growing number of elderly people around the country do not have family nearby to take care of them. For now, taxpayers have been able to pay for round-the-clock care, but that may not be the case for future generations. 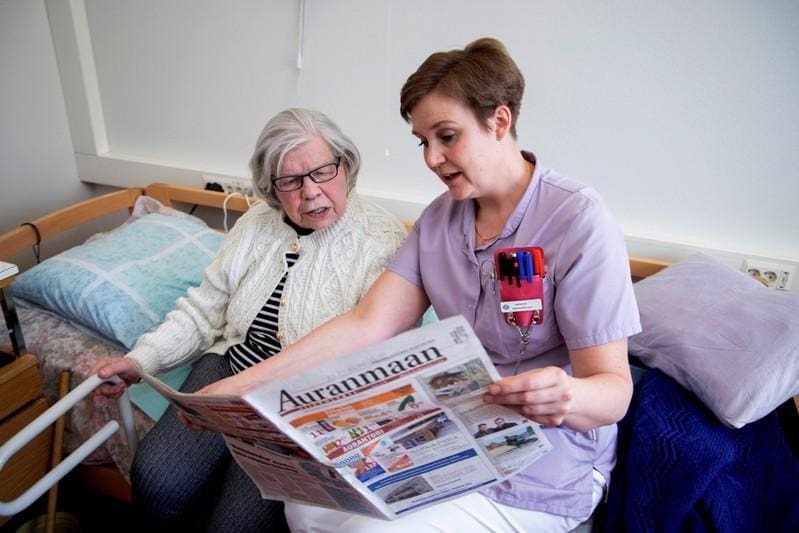 "The situation in Finland is different from for instance Southern Europe in the sense that we as a welfare society trust strongly that the state will fulfill our needs for treatment," said Annukka Kuismin, head of elderly care services in the Forssa region. SDP leader Antti Rinne says the state can afford to take care of its elderly but his main opponent, finance minister Petteri Orpo, called his economic policies "irresponsible". Polls show Orpo's National Coalition in second place at 15.8 percent, with the nationalist Finns Party third with 15.1 percent. Tuomo Turja, research director at pollster Taloustutkimus, said the government's popularity was initially hurt by imposing measures on the unemployed that forced them to take short-term jobs or training to avoid any reduction in their benefits. "Then there was the (failed) healthcare and social services reform and the debate about elderly care and nurse threshold," Turja said. Care home scandals added to the problem. Several privately-operated nursing homes have been shut down by authorities after investigations into fatalities and negligence. At one in Forssa operated by Attendo, authorities found there had been too few nurses, causing elderly patients to lie in wet diapers all night long. Attendo says it has taken action to improve its services, including hiring more personnel to assist with cleaning and catering to allow nurses to concentrate on nursing. But some voters have drawn their conclusions of the crisis and put their hope in the SDP to defend Finland's public welfare services. "Since I've inherited through my mother's breast milk a Social Democratic genetic ancestry, I hope and believe that they will settle these affairs better than the current government," said 61-year-old Lea Makela, who heads a local pensioners' association in Forssa. Makela said the elderly care crisis had caused many aging people to fear getting old. "My own mother is over 90 years old and looking at her, I am quite worried if we will have proper care and treatment at all when we turn 90," she told Reuters. Another voter, 73-year-old Hannu Rekunen, said he was worried about nurses whose numbers have been reduced to cut costs. "I hope that the Social Democrats too will do well in the elections and that's what it looks like," he said.